In this article we are going to focus on Working with AJAX in MVC application. We are using AJAX because it is asynchronous and it can partially load the page. It requests data from the server in the background without reloading the page. The MVC Framework unobtrusive Ajax feature is based on jQuery. Create a new MVC Application with basic Template and name it "MVCUnobtrusiveAjaxDemo". This will create a basic skeleton for our MVC application with the basic Controllers/Views/Models folders. Right-Click Models folder and Add Class Emp with the following code. We have a Emp class and an enum Dept which is used in Emp class to represent the department of each employee. 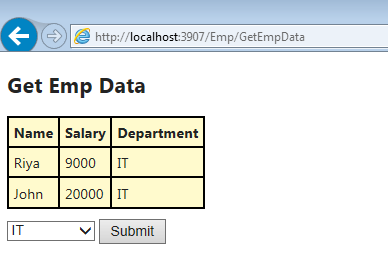 Right-Click the GetEmpData action method in the EmpController class and choose Add View. Keep the view name as it is which would be "GetEmpData". This will create "GetEmpData.cshtml" file in the /Views/Emp/ folder. Similarly Right-Click the GetEmpInfo action method in the EmpController class and choose Add View. Keep the view name as it is which would be "GetEmpInfo". This will create "GetEmpInfo.cshtml" file in the /Views/Emp/ folder. MVC Framework supports AJAX forms using the Ajax.BeginForm helper method. The first parameter to this method is the name of the action method that will handle the request and the second parameter is AjaxOptions object which we have created at the start of the view in the Razor code block. AjaxOptions class defines properties that can be used to configure how asynchrounous request to the server is made and how the data we get from the server is processed. In the AjaxOptions object we have set the UpdateTargetId property value to "tbody", which is the id we have assigned to the tbody HTML element in the view. LoadingElementId: Id of the HTML element that will be displayed while the Ajax request is being processed at the server side. LoadingElementDuration: The duration of the loading message that is used to reveal the loading element to the user. When the user hits the Submit button, an asynchronous request will be made to the GetEmpInfo action method and the HTML markup that is returned is used to replace the existing elements in the tbody. 1. Here GetEmpInfo is a strongly-typed view whose model type is IEnumerable<Emp>. 2. We are enumerating the Emp objects in the model to create rows in an HTML table. The jquery-1.8.2.min.js file contains the core jQuery library. The jquery.unobtrusive-ajax.min.js file contains the Ajax functionality. I try this article but i meet this issue how to fixed this?